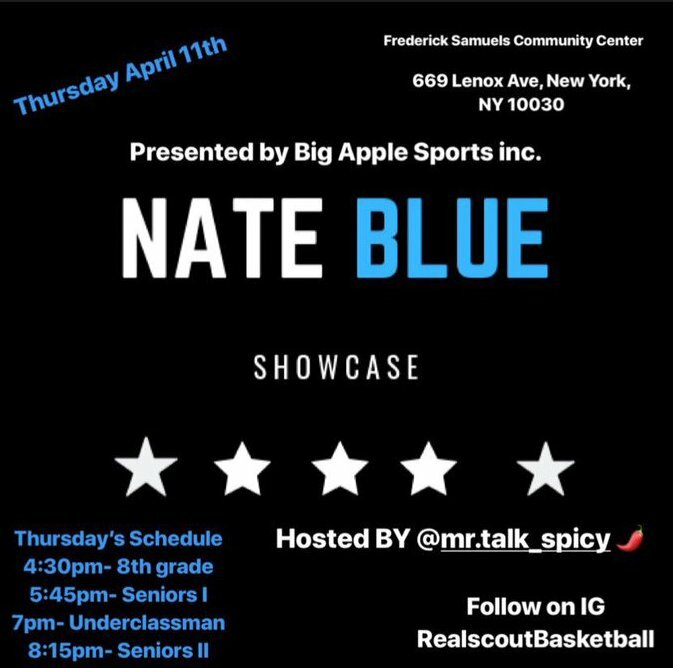 On Thursday RecruitTheBronx.com was on hand to watch the 5th Annual Nate Blue Showcase at The Frederick Samuel Community Center in Harlem, NY. The showcase is apart of the Big Apple Sports College Exposure Week, a 4-day event of unsigned senior games with college coaches in attendance. Nate Blue is the director of Real Scout Basketball and coordinator of the Nate Blue Showcase. Jaylen Murray 2021 6’0 Guard Cardinal Hayes - Lethal outside shooter can get hot from in a hurry. Can score in bunches. Finishes thru traffic well. Creates good separation off the dribble and screens. Shifty handle, very smooth offensive game. Needs to get stronger to finish thru contact better. Jaylin Anderson 2020 6’5 Small Forward Brooklyn Collegiate - Finishes well on the drive. Very active on the boards uses his length and athleticism to his advantage. Decent handle, has good slashing moves. Good defensive instincts can defend inside and out, has long arms. Needs to be a more consistent outside shooter. Elijah Hardison 2020 6’7 Power Forward Metro BDA - Athletic shot blocker, gets off the floor in a hurry to swat shots. Runs the floor hard, has his hands all over the court. Good athleticism. Is involved in every play somehow, high motor. Strong athletic body frame. Needs to stay disciplined on defense, but is very active on that side of the floor. Omar Sangare 2019 6’6 Small Forward Metro BDA - Good athleticism solid finisher. Hustles on both ends of the floor, active rebounder. long and lanky frame, he uses his length to his advantage. Streaky outside shooter. Can defend inside and out. Anthony Marshall 2020 5’11 Point Guard Metro BDA - One of the best PG’s in NYC, has a quick and shifty handle keeps defenders off balance. Quick first step and is a crafty finisher thru traffic. Elite finisher on the drive, has an array of moves. Creates good separation off the dribble for his pullup. Good 3pt shooter. Very good court vision, passes teammates open. Pesky perimeter defender has quick hands. Trey Clarke 2019 6’6 Wing Metro BDA - Good slashing moves out of triple threat. Athletic finisher adept at drawing contact and finishes well. Decent perimeter handle. Good rebounder. Solid body. Needs to be more consistent 3pt shooter. Shakiel Pennie 2019 6’5 Power Forward Metro BDA - Is a man amongst boys physically. Can jump out the gym and is an athletic aggressive rebounder. Great timing on blocks, an athletic rim protector. Gets putback dunks regularly. Needs to work on his handle and slashing moves he would be hard to stop on the drive. Jordan Agyemang 2019 6’5 Forward South Bronx Prep - long and lanky frame, athletic shot blocker, can finish thru traffic on the drive, can handle the ball on the perimeter. Needs to work on his outside shot to be a wing at the next level. Melquan Collins 2019 6’4 Small Forward Brooklyn Community HS - Explosive leaper can throw it down with authority. Good slashing moves, has a quick first step. Quick hands on defense has long arms helps him play passing lanes well. Needs to be more consistent outside shooter. Abahijae Cooke 2019 6’5 Combo Guard Carolina Basketball Academy - High IQ Guard, very good court vision. Gifted passer. Can score on all 3 levels. Crafty finisher on the drive. Good 3pt shooter, good sense of how open he is. Solid handle. Long and lanky frame. Charles Brown 2019 6’3 Wing Brooklyn Collegiate - Attacks the basket strong, consistently finishes thru contact. Crafty finisher thru traffic as well. Solid 3pt shooter. Strong body can defend inside-out. Good rebounder at his size. Majesty Johnson 2020 5’7 Point Guard Brooklyn Collegiate - One of the top Point Guards in NYC in his class. A true floor general who can set up teammates and see the floor. Quick and shifty handle, can create good separation off the dribble. Lethal outside shooter off the catch or dribble. Crafty finisher thru traffic on the drive. Pesky perimeter defender. Jimmy Romero 2019 6’2 Shooting Guard Lasalle Academy - Good outside shooter from midrange and 3pt. Moves well without the ball. Sneaky athleticism. Good finisher on the drive. Good at shooting on the catch. John Egbuta 2019 6’5 Small Forward Springfield Commonwealth - Explosive leaper, alley pop threat. Athletic finisher on the drive thru contact and traffic. Quick first step leads to a lot of posters. Decent outside shooter, continues to improve. Athletic rebounder. Zakai Zeigler 2021 5’7 Point Guard Montclair Immaculate (NJ) - Quick and shifty guard, can get to the basket in a hurry and finish over much taller defenders. Good playmaking ability. Pesky perimeter defender, has quick hands and moves his feet well. Abubakr Kromah 2020 6’4 Wing FDA - Explosive leaper and attacks the basket strong. Good body control on the drive. Quick first step, finishes thru traffic well. Good outside shooter off the dribble. Needs to get stronger to be more efficient thru contact. Gary Grant 2020 6’6 Wing St. Raymond - Can finish thru traffic on the drive. Good pull-up jumper and good slashing moves. Natural passer. Moves well without the ball gets easy looks. Long and lanky frame. Needs to get stronger to be more effective thru contact.